register until JAN 20, 2019 and take advantage of Early Bird Savings, exhibits and sponsorship opportunities for the IV. 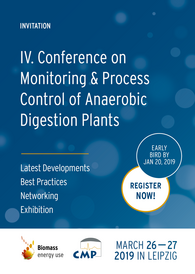 CMP International Conference on Monitoring & Process Control of Anaerobic Digestion Plants on March 26–27, 2019 in Leipzig. Check out the preliminary program. Top poster presentations will be selected to receive a poster award. 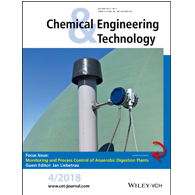 Authors of selected abstracts are welcome to submit a paper to a Special Issue of the scientific journal "CET Chemical Engineering & Technology" (peer-reviewed) until July 1, 2019. For detailed information on the schedule, programme, venue and accomodation please visit the event website. 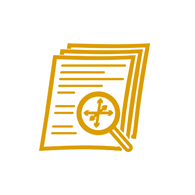 Contents regarding the agenda will be updated continously. We would appreciate it if you could forward this Program to other interested colleagues and institutions. For distributing the information on the conference you are welcome to use the Conference Flyer. All the best on behalf of the conference organizers and the Scientific Committee. Would you like to unsubscribe from the newsletter? Please contact diana.pfeiffer@dbfz.de.